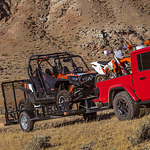 The Jeep truck brings a unique Jeep spin to the world of pickup trucks. The aesthetic recalls classic Jeeps of the mid-20th century. The Gladiator has hard-top and soft-top convertible version, unique among pickups. There are ten paint options for the exterior. To schedule a test drive for this innovative new truck, come see us at Ross Motor Company. We'd love to put you behind the wheel.